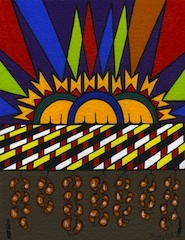 Available late this year or January 2012. MSU Press website here. 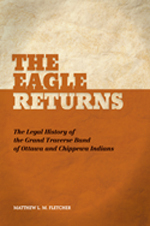 An absorbing and comprehensive survey,The Eagle Returns: The Legal History of the Grand Traverse Band of Ottawa and Chippewa Indians shows a group bound by kinship, geography, and language, struggling to reestablish their right to self-governance. Hailing from northwest Lower Michigan, the Grand Traverse Band has become a well-known national leader in advancing Indian treaty rights, gaming, and land rights, while simultaneously creating and developing a nationally honored indigenous tribal justice system. This book will serve as a valuable reference for policymakers, lawyers, and Indian people who want to explore how federal Indian law and policy drove an Anishinaabe community to the brink of legal extinction, how non-Indian economic and political interests conspired to eradicate the community’s self-sufficiency, and how Indian people fought to preserve their culture, laws, traditions, governance, and language.